If anyone asked me to sum up last week in five words or less, this is what they would have heard flowing from my mouth. What started this chain reaction was the moment I became ill. I felt a bit rough on Monday and noticed my throat and ears were becoming quite scratchy. I had an early night, but woke in the wee hours of Tuesday morning with lymph nodes and tonsils so swollen, it was like swallowing razor blades. My fever climbed to 104.3 degrees F later that day and I couldn't move my neck nor could I stop shivering despite the four blankets and hot water bottle at me feet. My doctor was concerned it was something serious, so she sent me to the ER. Turns out I had caught a nasty bacterial infection. Gross. Praise God for super strength antibiotics. As I laid dying on my bed while someone else's disgusting germs invaded my body, a home went up for sale on the only street my husband and I would even consider moving to. We don't necessarily want to move, but this area is so lovely, we could very easily be persuaded. The road is a cul-de-sac that backs onto a forest and ravine. It's only three streets over from where we currently live, so we'd technically be in the same neighbourhood. Homes that come available in this area are far and few, but when they do, they're snatched up so quickly. Unfortunately, we had to postpone a walk through visit until I could keep my head up and my fever broke. Not only did I pray I felt better soon, I was praying we didn't miss out on this opportunity. The plot thickens, friends. While desirable homes became available and I was confined to my bed, I still had to find time to create a three-tiered cake for an upcoming wedding that Saturday. To translate, I had two days to make, bake, frost, construct, and decorate a semi-naked wedding cake. 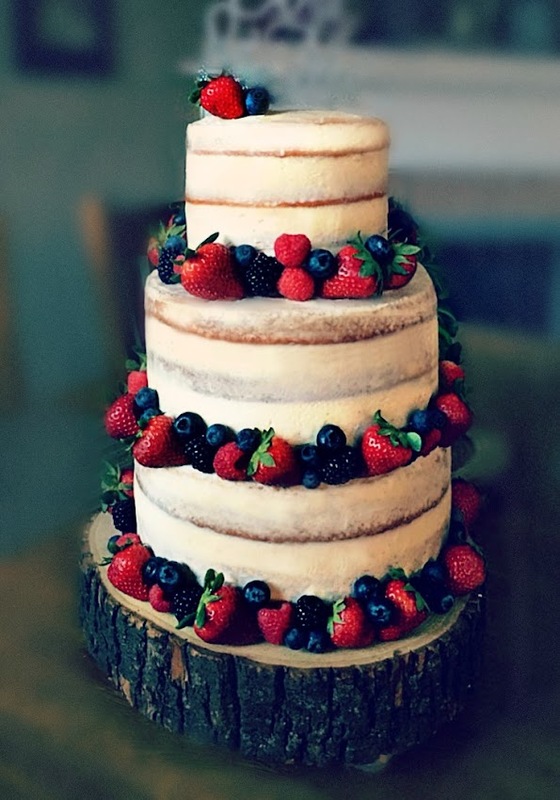 I don't know about you, but a three-tiered wedding cake isn't something one just whips up. It takes planning; precision. This is someone's wedding cake for crying out loud. My fever finally broke on Thursday and all day I looked as if I had just gotten out of the shower. You could ring out my hair and fill a bucket, not to mention the numerous change of clothing I went through. We finally called our realtor and booked an appointment to see the home later that day. 64 realtors and their clients had already been through the home by the time we walked through the door. The only evidence of activity was the business cards that littered the hall table, which I diligently counted. We weren't surprised really. Not only was the house absolutely stunning, the selling agent priced their home quite low, obviously hoping to spark a bidding war. Adding injury to insult, the agent also held back all bids for three days. As much as we loved this property, it's a battle we weren't willing to fight. In the end, there were nine bids on the table and the home sold for eighty-nine thousand dollars over asking price. I awoke early Friday feeling much better. I put the house disappointment and sickness aside as best I could and got to work. Armed with nylon gloves, face masks, and terry cloth headbands (I'm not even kidding), I plodded through the cake making sesh with flying colours. I had twelve cakes baked and cooled by lunchtime. I stripped my bed, disinfected the house, and finally ate something other than vanilla Greek yogurt and tepid herbal tea. By Saturday, the house was clean, the wedding cake was assembled, decorated, picked up, and delivered to the venue safely and I finally stopped sweating like the back of a toilet on a hot, humid day. I had a few cakes left over, so I did what I normally do. I reflected on the craziness over the past few days, made a Lamington cake, and ate my feelings. 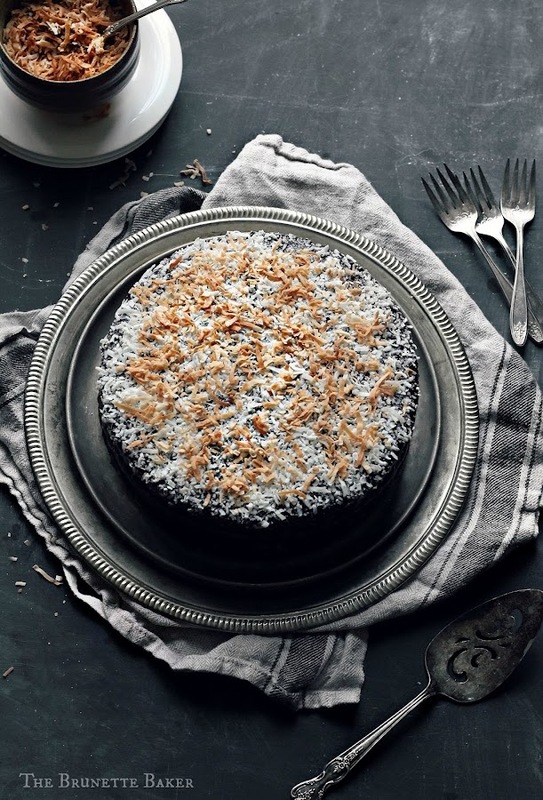 This Lamington cake is a take on the bite-sized cakes of the same name Australia is so well known for. I'm not a big fan of chocolate and fruit together, but this combination works beautifully and I'll happily eat it in its entirety. The bright side to this entire sham of a week? The wedding cake was a success. The bride's sister called to tell me that there wasn't one piece of cake left to be had. The food and beverage manager at the venue said he'd been working weddings for two years and he's never seen an entire cake disappear like that. I guess I found my silver lining in a hot pile of garbage after all. Preheat oven to 350 degrees F. Line three 9-inch round baking pans with parchment paper and spray with a non-stick cooking spray. Set aside. In a large mixing bowl, whisk together flour, baking powder, and salt. In a separate mixing bowl, using an electric mixer, beat together butter, and granulated sugar until light and creamy, about three minutes. Add in eggs one at a time, beating well with each addition for about 30 seconds. Add in vanilla and blend to incorporate. Scrape down bowl with rubber spatula as needed. Slowly add in flour mixture, alternating with milk, beginning with flour and ending with milk. Do not over mix or blend too long in between alternating as the flour will get overworked and the cake won't be as fluffy once baked. It's okay if there are still clumps of flour while alternating with milk. Just be sure to the final mix is smooth and lump-free. Pour batter evenly between prepared baking pans and smooth over with an offset spatula if needed. Place in oven and bake for 25 minutes, but check as early as 20 minutes as oven temperatures can vary. Cake is done when golden brown and toothpick inserted comes out clean or with very few moist crumbs. Cake will also start to pull aside from the pans. Place on wire rack and allow to cool for 10 minutes. Turn cakes out of pans and allow to completely cool on wire rack. Cakes can be frozen beautifully for one month prior to assembling. Just be sure they are securely wrapped in plastic wrap first. On the top of first layer of cake, evenly and generously spread warmed raspberry jam. You want a nice, thick coating of jam - about a cup for each layer. Top with second cake and repeat process. Once layers are assembled, place cake on a wire rack that has been lined beneath with foil on a large cookie sheet to catch chocolate drippings. Sift powdered sugar and cocoa powder together. This process is so important. If you skip it, you may end up with clumps in your otherwise very smooth chocolate sauce. Once sifted, set aside. In a medium saucepan over medium heat, combine butter and milk and heat until butter is melted. Remove from heat and add vanilla extract. Slowly add in cocoa mixture, whisking as you go until mixture is smooth and lump-free. Chocolate sauce will be thin, but will thicken as it cools. Slowly pour sauce over entire surface of cake, allowing it to free flow over the sides. You may need an offset spatula to coax chocolate into sides of layers. 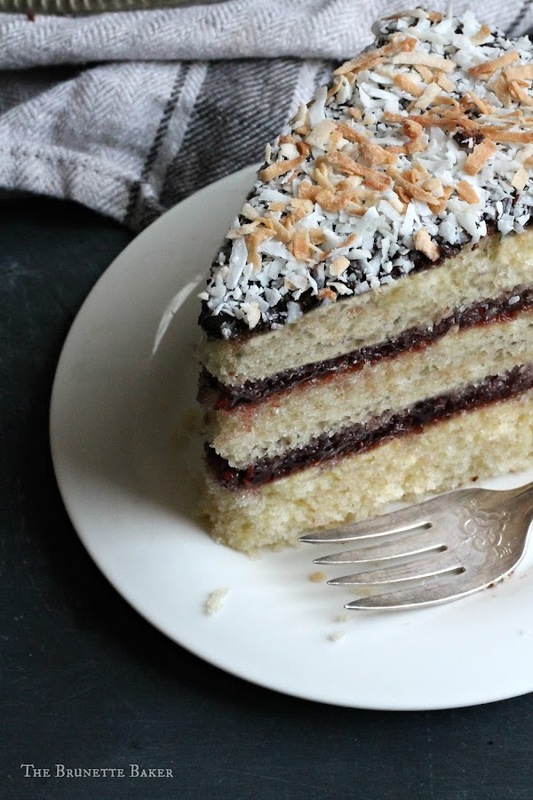 Once completely covered with chocolate sauce, sprinkle coconut over entire surface. I also added some toasted coconut for crunch and texture. Place in refrigerator for 15-20 minutes to set. Cut and serve. Cake will keep for 3-4 days, covered. 1. That wedding cake is top notch. YOU POOR THING! 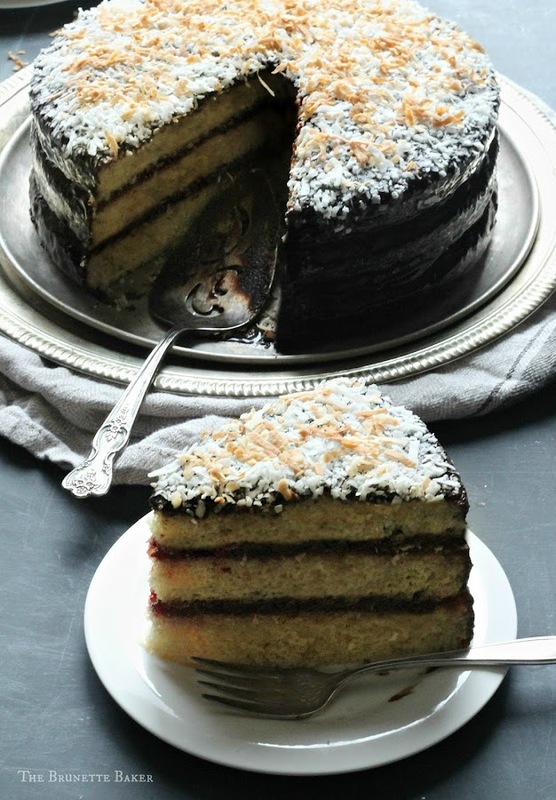 Ugh that is a lot of stress :( The good news is--that cake turned out beautifully, and so did this lamington cake! We made this cake for a BBQ and it was a huge success! I was a bit iffy and had little faith on the chocolate as it seemed runny, but it was perfect! Results were better than I imagined and I can't wait to make it again! Thanks for a cracking recipe!